The Office of Personnel Management named David Garcia its new chief information officer, agency officials confirmed to MeriTalk. Garcia started at OPM on Oct. 2. 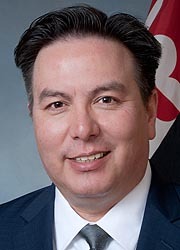 Garcia has also served as the chief of information technology for the State of Maryland and secretary of the Department of Information Technology (DoIT) from 2015 to 2017. Garcia oversaw the department that develops, maintains, revises, and enforces information technology policies, procedures, and standards in Maryland. Maryland has focused on upgrading legacy IT systems and obtaining cloud-based applications. The state was particularly driven to the cloud because the workforce became more mobile and needed to use state applications in any location, rather than just sitting at a desk in a government building. The applications that the state used before didn’t provide that capability, whereas cloud applications are built with that requirement in mind. Maryland chose to adopt Software-as-a-Service because cloud vendors had specific solutions to the state’s needs. Greg Urban, chief operating officer for the state of Maryland, said in February that in order for the IT department to understand the state’s needs, the agencies focus on building relationships, trust, and respect. “It’s really important to understand the missions of the agencies we support so we can be a partner with them,” Urban said. Garcia replaces David DeVries, who left the agency on Sept. 2 and now works as the CIO for the state of Michigan.